hey all, today i am bringing to you some tips and tricks on how to pass the time with your toddler. 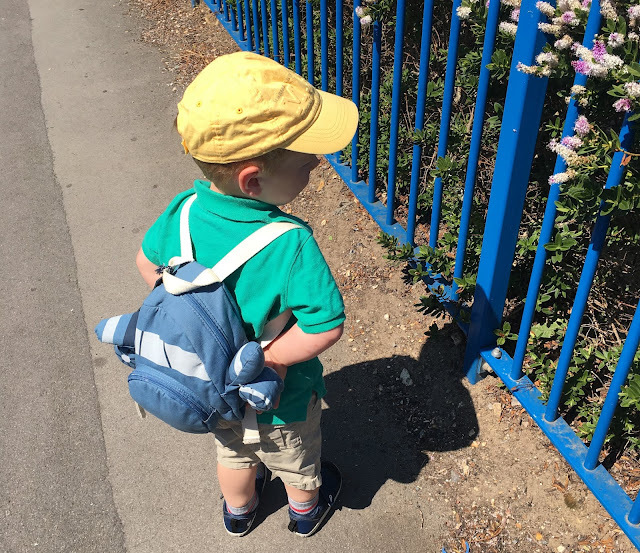 which, as any other stay-at-home mum will know, is not easy, because toddlers can be both super challenging and super boring. it's hard as a mummy to stay motivated and excited and keep the rhythm of the day flowing happily day in day out. for the first 18 months of my son's life i didn't find anything to be too boring; i loved breastfeeding and i loved the challenge of getting him to sleep and continually changing and optimising his sleeping routine, as well as trying new foods and watching him learn to crawl and walk. but then after the 18 month mark, things slowed down a lot and there were fewer new things to watch, and the routine sort of stayed exactly the same... so it got pretty dull. also, my toddler is really keen and ready to learn, and he daily needs a challenge to help him grow and develop. i must honestly confess that, in comparison with other parents, i'm quite laid-back and i like to be at home. there are plenty of mummies i know that simply like to pass the time by going out and doing activities. but, i find it so exhausting to be out with him, so i don't do a big outing every day, instead we do that 2-3 times a week. i also really value independent play - i think it benefits both parent and child, and i have spent most of the first two years of his life encouraging him to interact with things in his own unique way. there was a very long period up until he was about 25 months where he really needed my help with everything, or he needed some companionship, so instead of being able to do anything else whilst he was playing, i actuall had to do all the playing with him. and then come 25 months-ish, he was much more able to play by himself, except on days when he was too tired or feeling sick. - the park - we go to the park at least once a week, because the good ones are a bit of a walk or a bus ride away. and we love it! as he spends more time there it's so fun to watch him increase in confidence and learn to use his body in new ways. he also gets to interact with other children, and burn off energy. - soft play - this is a new one to us, but our friends invited us last week and we loved it! it was early morning so it wasn't busy and we both had so much fun climbing around and going down slides and up rope ladders... and they even had a break for a craft activity included in the entrance fee. we will definitely be going again. - playgroup - i must be super honest and say that i've really put off going to a playgroup in my local area since i moved back to England. partly because i thought we'd be moving house sooner than we actually have, and partly because they're so darn intimidating. but there are so many to chose from and i know it would be great for him to go and interact with other kids. also, when we first got back to England he went through a hair-pulling/hitting phase, which wasn't fun for anyone, so i sort of have been waiting for it to pass and then when he stopped several months ago i just haven't organised things yet... so watch this space. - a city walk/nature walk - a guided walk is so much fun, because he learns so much about the world around him. whether he's actually walking or sitting in the pushchair taking time to explain all the things around him is both important and interesting. at the minute he's really enjoying learning his colours, so we get a lot of "red bus" or "purple car". - coffee/lunch dates - i have tended to do less coffee dates and more lunch dates, because he loves eating out but not just sitting and playing in such a confined space. so, we usually go to the same two spots and he has learnt how to interact in both of those spaces, so he is well behaved and know where his boundaries are, so i can relax and enjoy myself more. - swimming class - his gran takes him swimming each week, as we've just signed up at the local pool. it's quite pricey, but teaches him an essential skill so i feel the cost is worth it. and after our last holiday to Corsica where he enjoyed swimming so much, i wanted to "take the bull by the horns" and see how he'd enjoy classes. and he does love it! it also provides me with an essential hour off from looking after him which is pretty important! - play with his toys - i have a video sharing all of our favourite toys, so go watch that if you haven't already - his absolute favourite that he could play with for hours is his wooden train track (US/UK). honestly i don't know how i would parent without those trains! - listening to music - he loves to sit there with my headphones in, listening to his favourite songs on repeat. so of course i need to be nearby so that i can make sure his songs are all playing - i've got a playlist for him on the iPhone but often he just wants to listen to the same song again and again. - pouring in the kitchen sink is something he still loves - he gets up on his little step, and digs his hands in to play with whatever is in the washing up bowl. he loves the bubbles and he loves to pour and experiment. i can get a good 20 minutes out of this activity usually, so it's great for me to clean the kitchen and sort out the dishwasher each day. - threading beads - i can get about 3-10 minutes of concentration of him using his threading beads (US/UK). which is great for putting makeup on, and honestly he's probably getting a little old for it now. we might need to start moving into matching games. - sidewalk chalk - these chalks (US/UK) are great, because they're pretty versatile if you've got any outdoor space. you can draw with them, and then (perhaps the most fun bit for my son) wash it all off. and then just repeat that process on different surfaces to see how it will react. and older kids can get involved too. we love this stuff! - finger painting - we've been using some lovely eco finger paints (US/UK), which work brilliantly for him, because he learns that he is allowed to get his fingers dirty (which he isn't normally a huge fan of) and that he can create something so amazingly colourful. - using Procreate on mummy's iPhone - i got a Wacom Stylus pen (US/UK) for using with my iPhone and my boy loves to use it with Procreate Pocket, where he can pick the colours and types/sizes of brushes and create something amazing. - drawing & stickers in his art book - i got him a giant A2 sketch book ages ago (US/UK), and it's already pretty full of all of his scribbles, stickers and doodles. there's also some finger painting in there, stamping and various other things we've tried out a few times. the notepad also gets used as a ramp for his trains... and one of our other new favourites is using some Gelatos (kind of a cross between a lipstick and a watercolour - the 12 piece set i got also came with a brush, but there are varying sets you can try - US/UK), which he loves to use in his book and on his waterproof mat. - dancing - we move all the toys out the way and put on a really loud song and have a good wiggle. sometimes we even get the musical instruments out and use those too. but he loves to practice jumping and twirling, and he can really move! - watering plants & weeding - this is something we do together or else next door would get wet, or I would get soaked, or my favourite plants would get pulled up - i love showing him how to work the earth, and i'm excited for him to be a whole year older so we can plant seeds and he can understand things even further. he loves to help move branches for me too, so he's a great help when i trim the bushes. - glueing and sticking - good old-fashioned paste scrapers and kid-safe PVA, along with a sheet of paper of some kind, and then some scraps of other papers, tissue paper, fabric or anything else that you can find, and then you can create some spectacular pieces of art! - screwdrivers - daddy's screwdriver set is an endless source of fascination. he likes to get them out and find anything with screws. currently he's not strong enough or silly enough to ruin the screw, the house or the screwdriver... so mostly he just tried to replace the batteries in his trains. - puzzles - we've only got a couple of wooden puzzles (US/UK), but he's pretty good at them when i sit with him and encourage him along. it only takes a few minutes, but i feel like it's an activity worth investing in, because if he continues to enjoy it and can handle more complex puzzles he'll be able to sit for hours with a 1,000 piece as a teenager. - flashcards - we've got a couple of sets (this is our favourite - US/UK) and he actually likes to get them out and see how many he can do in one go. i would've thought somehow i would have had to make it into more of a game, but he seems to do that all by himself. he's always looking for the chicken. and if you're all out of ideas still, i really recommend this book by A.M. Sterling called "Montessori at Home Guide" (US/UK), and it's full of very easy activities to do, which is perfect if you're after helping your child to be helpful, as well as keeping them busy with activities. - cleaning & hoovering - my son loves to spend ages cleaning his cars and hoovering with our mini handheld vacuum cleaner. how did i miss this from the original list! - going on a train or a bus - often we just get a cheap bus ticket into the city centre and that's our outing of the day. it's a distraction, a simple one, and he usually loves it. we tend to plan on a train trip a few times a month, which is a much anticipated and enjoyed excursion.